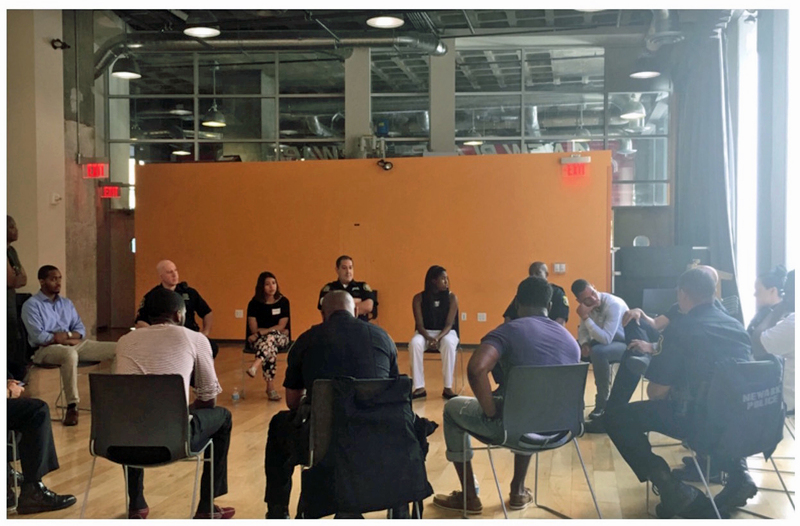 Pictured: Dr. Lenora Fulani leading an Operation Conversation: Cops & Kids workshop with New York City Police Department officers and inner-city youth. 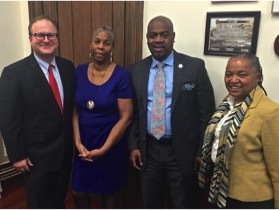 Mayor Ras Baraka, having returned from a White House meeting on police community relations, committed the City of Newark in conjunction with My Brother's Keeper Newark to expand the city's police community relations strategy through a partnership with the All Stars Project. The partnership will bring “Operation Conversation: Cops & Kids” to neighborhoods across the city. 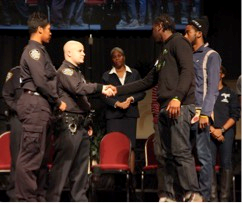 Operation Conversation: Cops & Kids (Cops & Kids) was created by ASP’s co-founder Lenora Fulani, Ph.D., a developmental psychologist and grassroots educator, in the aftermath of the 2006 police shooting of Sean Bell in Queens, New York. Community workshops use performance, improvisation and conversation to help teenagers and police officers build trust and create alternatives to how they usually interact with each other in the community. The New York City Police Department (NYPD) now has all Police Academy graduates participate in the program. Dr. Fulani and the program were recently awarded the Cisco Award for Community Policing by the International Association of Chiefs of Police. "After the tragic events in Minneapolis, Baton Rouge and Dallas, attention must be paid to the models and approaches to police community relations that have the trust of both sides," said Dr. Fulani, who met with Mayor Baraka in February to discuss the outlines of the program. “We recognize that the antagonism between the police and youth in poor communities are real and dangerous. At the same time, we recognize that cops and kids share many things in common – they often come from similar backgrounds, they leave their house in the morning not knowing whether they will make it home at the end of the day. We have discovered a way to use performance as a tool to break down barriers and to be able to see the ‘other’ in new ways." The first Cops & Kids workshop in Newark took place on June 30th at All Stars Center for Afterschool Development at 33 Washington Street in the Central Ward. Monthly workshops are planned between now and the end of the year. In addition to its partnership with NYPD, the All Stars Project is partnering with the Dallas Police Department. About All Stars Project, Inc. The All Stars Project (ASP) is a privately funded national nonprofit organization founded in 1981 whose mission is to transform the lives of youth and poor communities using the developmental power of performance, in partnership with caring adults. All Stars Project of New Jersey is headquartered at the Scott Flamm Center for Afterschool Development located at 33 Washington Street and is supported by some of America’s leading companies including MetLife, EY, Viacom, PWC, PSEG, Prudential and Investors Bank. Led by President and CEO Gabrielle Kurlander, the ASP involves over 10,000 young people every year in its afterschool programs in six cities across the country. Learn more at http://www.allstars.org, on Facebook and on Twitter @AllStarsProject. Pictured: Newark police officers and inner-city youth participate in the city’s first Operation Converation: Cops & Kids workshop at the ASP of NJ Scott Flamm Center for Afterschool Development. Pictured: All Stars Project co-founder, Dr. Lenora Fulani (far right), ASP of NJ City Leader Gloria Strickland (front, third from left) and My Brother’s Keeper Newark Director Will Simpson (back, left Pictured (from left to right): ASP of NJ Director Chris Street, All Stars Project co-founder, Dr. Lenora Fulani, Mayor Ras Baraka and ASP of NJ City Leader Gloria Strickland.